“Good Evening, my name is Ron King and I am the focus of some recent media attention based on lies, false information and political agendas. “First, you’ll have to excuse me if I refer to my computer here for some of my notes. There are a lot of thoughts that I want to get out and its just way too many to try to memorize. “I would like to start my statement by first apologizing to the family of Trayvon Martin for being used as a pawn in somebody’s political agenda. Additionally, I would like to apologize to my fellow law enforcement officers for any negative light that this has come from this incident. “I have been a law enforcement officer for over 25 years and a firearms instructor for almost as many. And I take both of those jobs very seriously. “As a firearms instructor I have taught over 1,000 cadets, working police officers and private citizens firearms safety and the judicious application of force. My students have varied in range of experience. Some have never held a firearm in their life, others have more than 30 years of law enforcement experience. “I am being accused of using a Trayvon Martin silhouette target for firearms training in a manner that is less than professional. I take these allegations seriously and I find that others are accusing me of something that I just plain did not do. “Mr. Walsh, the acting CEO of Port Canaveral: You issued a statement that I offered the targets to others to shoot. “Sir, that is a complete fabrication. I have here the copies of the statements made by the complaining party and a witness. Both of whom stated that I referred to that as a no-shoot training aid. The complaining party specifies that the target was not used. The witness went on to further state that I used it as a training aid, that it was a no-shoot training aid and that no derogatory comments were made. “As an instructor in the law enforcement field, I can tell you that real life situations as a training scenario is not uncommon: bank robberies, traffic stops, school shootings, like the one in Columbine and the most recent one in Connecticut, are all the basis for training scenarios and the use is not uncommon. They are in fact what teach us to respond to incidents in the future. 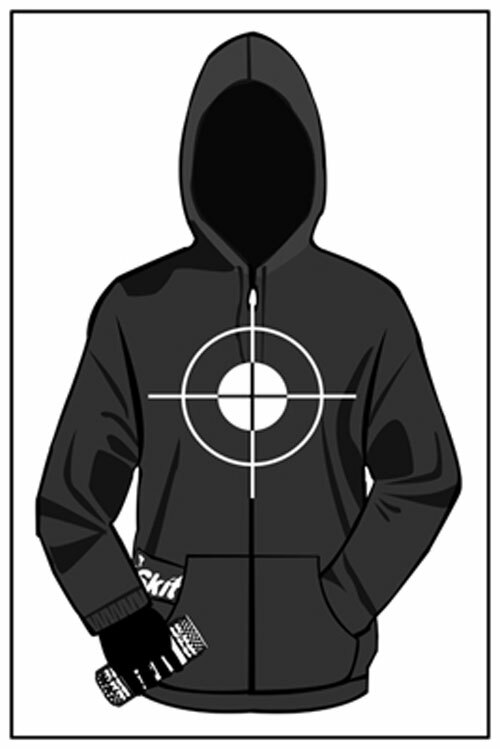 “As a result of last year’s Trayvon martin shooting, a company offered for sale a target of a faceless silhouette wearing a hoodie with his hands in his pockets, one of which was holding two objects, these objects in the hand were non-threatening and the target was something that I viewed as a no-shoot situation. “While others used it as a novelty, I view it as a tool for scenario based firearms training. Although to date, the targets have never been used, I did possess the targets for those training reasons. “On April second, I was discussing the training needs for my agency’s officers with another sergeant and I mentioned that I had these training aids. I showed the sergeant what I was referring to and instead of commenting as to whether or not he thought they would be useful, he chuckled and he stated that he would, I’m para… his son would, and I’m paraphrasing, get a kick out of one of those because he often wears a hoodie and that when he does he tells his son, ‘Be careful Trayvon.’ Apparently, he jokes with his son about the Trayvon Martin’s incident. “While others like myself choose to look for training methods to prevent another such situation. I did offer the sergeant one of the targets to give to his son. Instead, he asked if he could take a picture of it and send it to his son on his phone. “In hindsight not taking into account the situation, I should have not offered the target to him, and I should not of allowed the picture. For that I do apologize. To my knowledge, the sergeant did not send the picture to his son. Instead, he used it to file a complaint with my agency’s human resources department. “This is where the lies, false information, political agendas that the Martin family and myself are being used as pawns in again. To explain the political agenda, I would like to mention that the sergeant that filed this complaint has for months been very vocal that he felt the chief needed to be dismissed and would be surprised to see him there much long and he that thought it would be best for the agency if he left. I cannot help but think that he is using this in order to try to shed bad light on the chief in an effort to further that agenda. “Regarding the statements made by the CEO of the port, the only stupid act I performed was to believe that some of my coworkers would be mature enough and care enough to use a bad situation as a learning tool. “To the Martin family I would like, I’m sorry I lost my place… To the Martin family, I would like to apologize again for those law enforcement officials that choose to use your son’s death as an element for their personal and political gains. I assure that the use of these targets there in question is to prevent a tragedy from taking place. I was not present the night your son was killed. I do not know the facts of the case and I reserve judgment on either side. This entry was posted in Firearms, Legal, Misc., Uncategorized and tagged firearms target, Port Canaveral Police Department, Sgt. Ron King, Skittles and Arizona Iced Tea, Trayvon Martin. Bookmark the permalink.